It is with great pleasure that I announce the immediate takeover of Volunteer Oaxaca by Rebecca Bailey of Que Pasa Oaxaca. 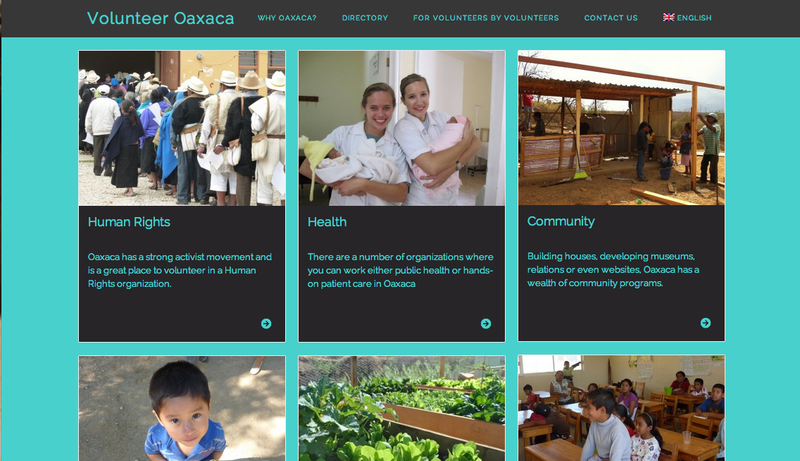 As many of you may know, I started Volunteer Oaxaca (Mexico Retold’s sister site) back in 2013 to help volunteers and non-profit organisations connect with each other. From my experience of volunteering in Oaxaca, I realised that there were many organisations looking for volunteers and many volunteers looking for places to work, but they weren’t always finding each other. So with that idea in mind, I created this bilingual directory to help bridge this gap. Upon launching, I immediately heard stories of the connections that the site was facilitating. One small non-profit rang me to tell me that a potential volunteer had found them through the site and had got in contact with them. The volunteer had asked how they could help and immediately donated $100 USD. I was overjoyed, that the directory was doing its job. As fate would have it, however, as I launched Volunteer Oaxaca my freelance writing career started to thrive and I was unable to dedicate time to promoting and developing this precious resource. Whilst Volunteer Oaxaca, rather successfully, sold itself, I could see that I was not able to really develop it to its full potential and I was left with a nagging feeling that I needed to find someone who could. With that in mind, I got in touch with Rebecca. I had watched how she built her site Que Pasa Oaxaca (for which there was a huge gap in the market) and grew it into a resource that benefits so many of us everyday. It is the place to go to find out ‘what’s on’ in Oaxaca, and in a city so full of cultural events, that is no mean feet. Que Pasa Oaxaca and Volunteer Oaxaca seemed like the prefect fit, and I was delighted to discover that Rebecca felt the same. Rebecca is full of exciting and innovative ideas for moving Volunteer Oaxaca forward and I have every trust that her work will benefit the non-profits and volunteers of Oaxaca and beyond! So please show Rebecca your support, by liking the Facebook page, following Volunteer Oaxaca on Twitter and spreading the word.